You’re Sweet! Taylored Expressions Release Day! Hiya everyone, It is the release day at Taylored Expressions. Yay! All the new goodies I showcased over the past three days are released today. You will love the new stamp sets, dies and embossing folders. They are gorgeous and summery. 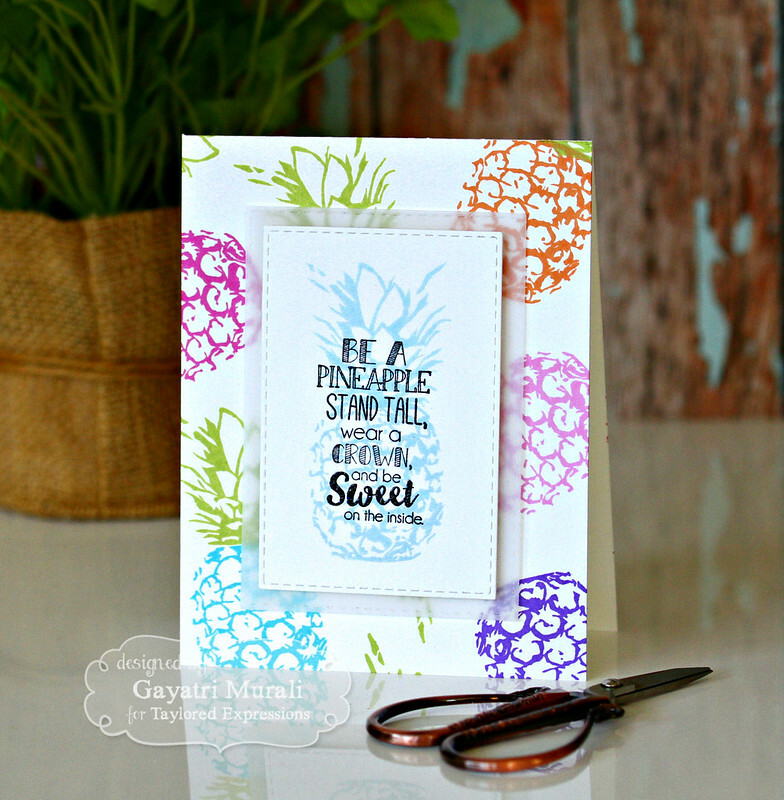 I am showcasing a stamp set and coordinating die called Simply Stamped Pineapple. 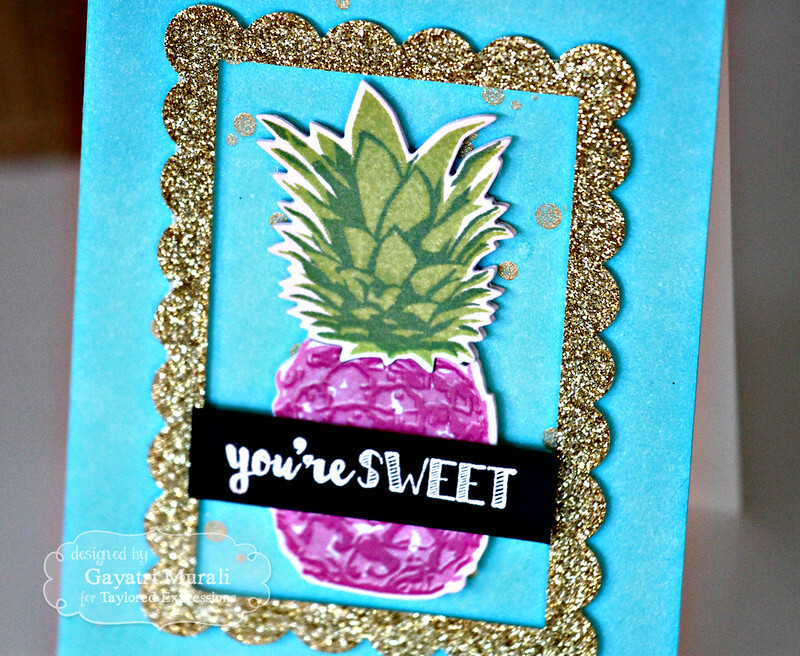 You have seen sneak peek of the pineapple on my gold foil card on day #2. This is a layering stamp set and has coordinating dies for it. Woohoo! Love pineapples and coordinating dies too. So I ahve two cards to share with you. 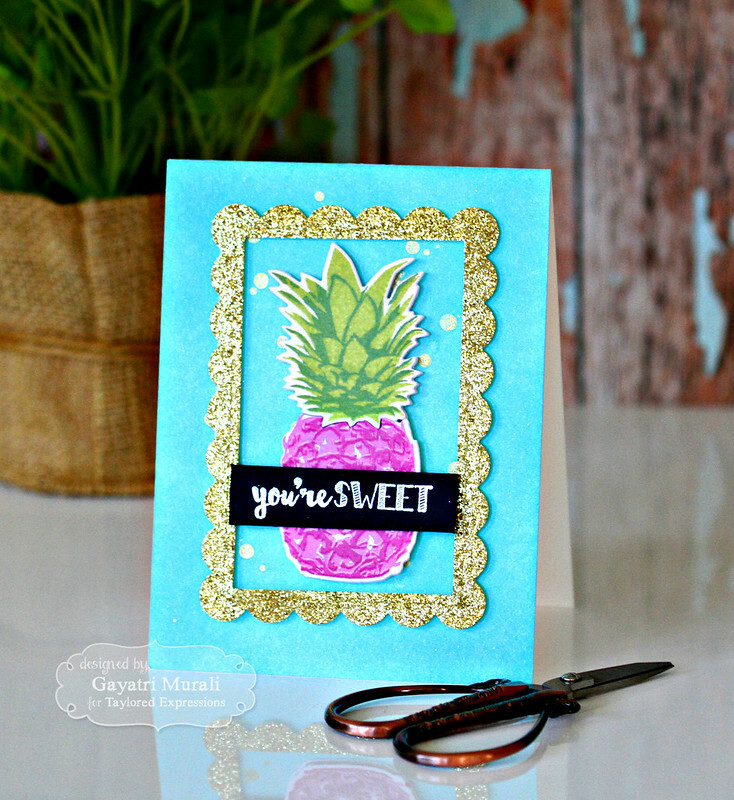 One my first card, I have stamped layered the pineapple and used it as a focal point. This card is more stylised and hence the pineapple is not in its original colours. I sponged the background of the card with Cookie Monster dye ink and spattered gold color shine. Then stamped the pineapple using Strawberry Milkshake and Lollipop dye ink. I need three shades of pink but I had only two colours. So after stamping the second layer in Lollipop ink, I stamped the second layer again in White pigment ink. This gave me the third medium pink colour. The last layer is stamped with Lollipop dye ink. For the leaves, the base layer with Granny Smith and shading layer with Peapod. The leaves have two layers only. I die cut them out and a few more using white cardstock. I layered glued them with the stamped pineapple on the top to give added dimension. I adhered this on the centre of the card front. I framed the pineapple with gold glitter scalloped frame die cut using Frame in Frame 2 die set. The sentiment is white heat embossed on Oreo cardstock. For my second card, I used the pineapple stamp for my background and highlight the beautiful sentiment from the stamp set on the card. I used the third shading layer of the pineapple and the second shading layer of the leaves with various colours of dye ink from Taylored Expressions to create my background. Then I die cut a layer of vellum and a smaller layer of Sugar Cube cardstock using Stitched Rectangle Stacklets. On the white panel, I stamped the pineapple using Salt Water Taffy and the beautiful sentiment from the stamp set in Versamark and Oreo hybrid ink and clear heat embossed. This panel is layered with vellum panel and adhered on the card front using foam adhesives. Simple, colourful and stylish. I LOVE that sentiment. All the new goodies are available at Taylored Expressions store for purchase now. Please visit Taylored Expressions Blog for more inspirations from designers. Oh My – this is fabulous! !